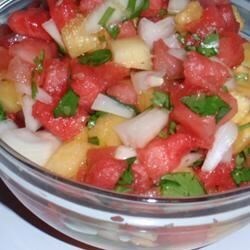 "Watermelon, crushed pineapple, sweet onion, cilantro, orange juice and Tabasco® make a refreshing summer twist on salsa. Bring copies of the recipe whenever you bring this, people will beg for a copy! Serve with tortilla chips." Stir the watermelon, pineapple, and onion together with the cilantro, orange juice, and hot sauce in a bowl. Cover, and refrigerate at least 30 minutes before serving. This is good, but I think that next time, I will use a jalapeno pepper instead of the Tabasco sauce! This is an easy recipe, one that is worth having! this was so delicious and refreshing! i didn't have orange juice so i just used a tropical fruit juice blend, and only use half an onion or less and let it sit for awhile. Surprisingly tasty and the flavour was pretty close to tomato salsa!